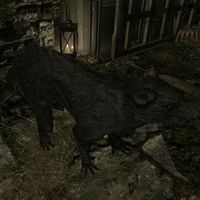 Skritch is a trained skeever trapped in a cage inside the Ratway. You can free it to make it your pet. It can be equipped with both an Animal Collar and an Animal Pack. It is essential and will not engage in combat. Skritch can be summoned using a teleportation spell. It can be instructed to follow you even if you already have another pet following you. You can instruct it to wait at a city, wait at its current location (either temporarily or permanently), wait at your house, or to carry items. It can also be instructed to "go find food", which will cause Skritch to run to the nearest item of food. If there is no such item nearby, you will receive a message stating that Skritch couldn't find anything. The Pickpocket's Journal contains background information on Skritch. 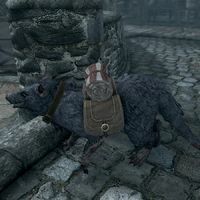 When equipped with an Animal Pack, Skritch closely resembles the Pack Rat from the Tribunal expansion for TES III: Morrowind. Skritch, unlike other skeevers, has a full coat of fur with no exposed skin or blood. His coloration is also slightly different from other skeevers. However, he still has lesions on his legs and tail. This page was last modified on 16 January 2019, at 01:02.